Zebra TTP 8200 - Standard, 203 dpi, 216 mm, cutter and presenter. Interface cable and power supply sold separately. The Zebra TTP 8000 series kiosk printers offer 203 dpi resolution for full-format A4 or letter-size printouts of forms, bank statements, maps, or Web pages. The fast, compact and low-maintenance design makes these printers ideal for unattended environments. The pull detector and jam-preventing loop presenter provide trouble-free operation. 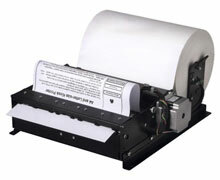 The retract function keeps sensitive documents from being left behind outside the kiosk, and it saves media. If a printout is not taken from the printer, the output will be retracted, and the remaining information can be deleted from the queue, eliminating unwanted print jobs. The TTP 8200 is available in three configurations for flexible kiosk integration: standard, compact, and vertical, each equipped with standard USB and parallel interfaces. For additional configuration flexibility, the media can be mounted either behind or below the printer. For applications requiring crisp images, Zebra offers the TTP 8300 kiosk printer with 300 dpi resolution. The Zebra 01744-216 is also known as ZEB-01744-216	or 01744216	.